The end of Christmas is nearly upon me. You probably think I have gone mad and that Christmas ended almost a month ago now but for me it is very soon… because we are finally down to the last few pieces of Christmas cake. Anyone who makes a Christmas cake realises the time and love that goes into it. You make it at the end of October, bake it for hours, then lovingly feed it every week (dark rum for mine) and finally you take your time to decorate it with your hand crafted sugarpaste decorations. This year I spent a lot of time working on my decoration as it was made over 2 of our lessons at my college sugarcraft course. I learnt how to draw it on paper first, cut it out and then build it up till finally I had something which resembled Santa and his reindeer. 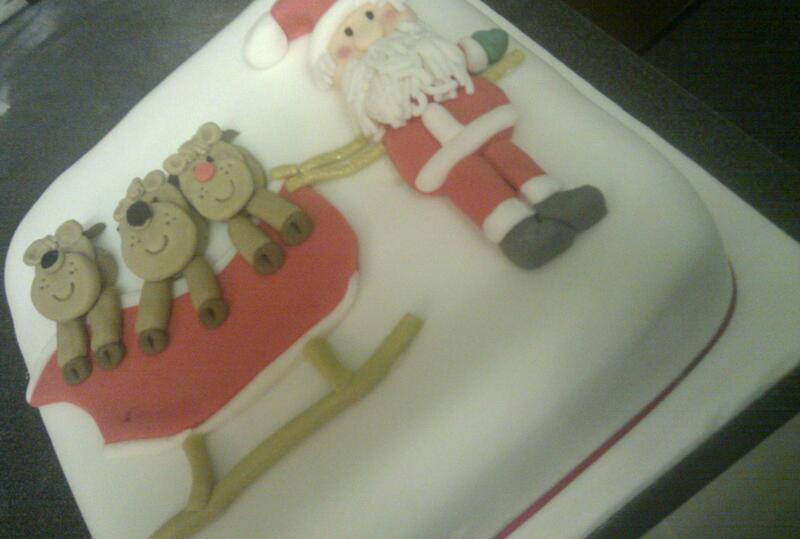 The only good part of finishing last years Christmas cake is that I can start designing this years. I have my idea already so I really should write it down; I don’t want to end up panicking on Christmas Eve and icing it with whatever decorations lie around my cupboard. Unfortunately as well, the end of the Christmas cake also signals the start of the New Year diet. Don’t worry though readers, I won’t be hanging up my apron just yet, I just need more volunteers to eat my baking – any offers?